We love ‘em. They carry us through life, take us to amazing places, enable us to dance. We adorn them, tattoo them, encase them in the ridiculous, the sublime, the magical. Even when we have nothing else, we find a way to protect them. When all you have are plastic bottles, everything looks like a sandal. “Four legs good, two legs bad” I remind my canine companion as she bounds across the icy driveway or down a steep slope–while here’s me, creeping and tottering, visions of casts and crutches just one misstep away. Feets, don’t fail me now! From foot-washing in the Bible (19 mentions) to foot-binding in China, feet are a human obsession. It’s a safe bet that animals don’t obsess about or even think about their feet the way human animals do. But their feet carry them through life, too–however natural and satisfying or short and tormented those lives might be. For the 42-45 days they are required to live and suffer before they end up in buckets, nuggets, Buffalo sauce and franks, broiler chicks stand in their own waste. Blinded by fumes and suffering respiratory ailments, they are also scalded by ammonia on body and feet. Despair–I feel despair. Not for the chicks whose suffering has ended, not even so much for the hundreds of millions already taking their place, but for my own species. Despair that Homo sapiens–whose precious feet carry us through life and into the sun–can’t conceive, won’t acknowledge, or (the horror!) simply don’t care that our fellow sentient animals, given the choice, would also choose walking in the sun over standing immobile in caustic ammonia for the entire span of their painful, unnatural lives. Rather than tearing down the factory farms and ending the suffering, we find a way to remove the “blemishes” of suffering and optimize profits. Where, oh where is our humanity? Why do these dark minds call these beautiful feet paws instead of claws? What use are these “dead” claws/paws, which belong to beautiful feet once attached beautiful live animals? Correction: …once attached to beautiful live animals? Whole lotta snackin’ going on…in China. At $400 a metric ton they might as well say “free”. 😦 And yet, priceless to each pair who owned them. 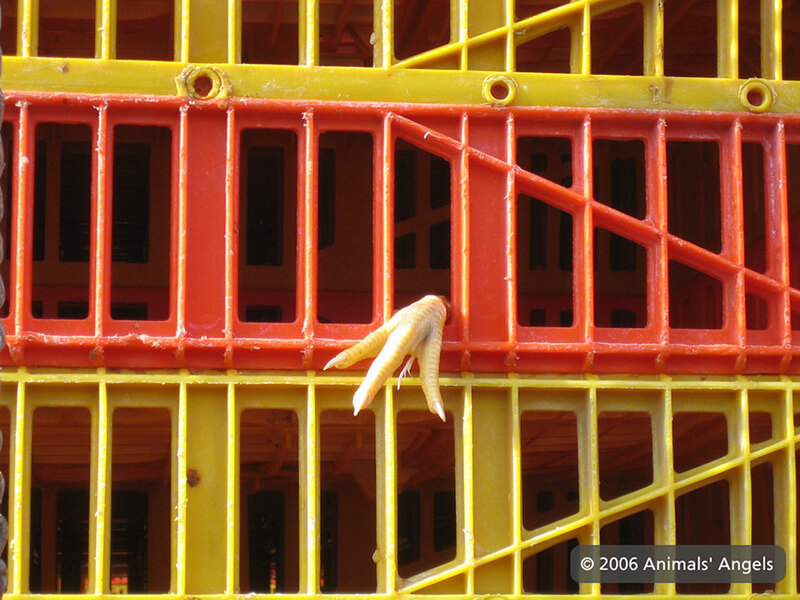 But I have a happier story to tell of chickens feet… Good news is sometimes so hard to come by. The “feed store” that I get chicken food from also (of course) “sells” animals too… I’m on their list to call in case one is to be destroyed… Typical of any animal-industry it’s never profitable to tend to the cheap birds. Anyway, I brought a small chick back home with me. As I named her – Hope was hobbling due to these burrs, blisters, callouses or whatever they’re called… Twice a day I soaked her tiny feet in baby oil and peeled away what scar-tissue there was… Within a few weeks she was non-stop-mobile! I know this little story does nothing in the weight and scale of the billions who never had “hope”, justice or even any speck of kindness given to them. I just don’t know how to make the world see and care — I can only cling to what I know matters… Among those certainly are chickens feet attached to the live and free being who possesses them. And thank YOU, Bea…your story is priceless, and so are you. We are all doing “only a little,” but it matters. I absolutely agree. But sometimes I feel that whatever little I am doing for animals is too little and too late. How did the human race get to this point where the suffering of billions of defenselss and helpless animals is considered standard business practice. 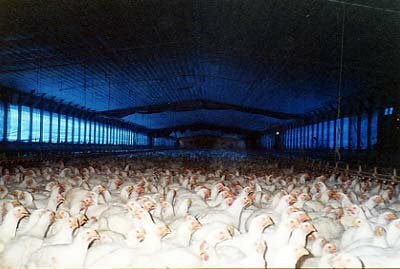 I often wonder how the ‘humans’ who work on these factory farms can go home to their kids and lead a normal life. How do they sleep at night? Probably they are not ‘humans’ any more.